I have 43 cans of this. What should I do with them? I’m not sure what my original intentions were when I purchased them but now I need a plan. I unearthed them yesterday as I was packing up some items from my pantry. They had been shoved into a corner, a million boxes of cereal hiding them from immediate view. So does anyone, even one person, have some bang-up recipe ideas or uses, besides just drinking it? And please don’t say Bloody Mary’s, I really couldn’t drink that many. Well, you could bathe a drunk, skunk sprayed dog in a tub full….or host a party and serve a LOT of tomato soup with this as the base, or, sorry, serve free Bloody Marys, with a requirement the guests BYOV ( Bring your own vodka). Could be a lot of fun, and you won’t have to haul those cans of juice to Oregon! Is it any good using in place of stock in soup? 2. Open them, put them in a barrell & ferment them, then rebottle them & sell them…then it’s HIC all the way!! I use v-8 as a base for vegetarian chili, but you’s have enough to serve an army with 80 cans! Otherwise, I use V-8 when making my crockpot jambalaya, porcupine meatballs, tortilla soup, and so forth. 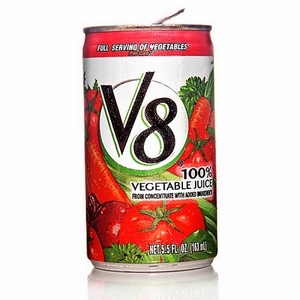 Any time you would use tomato juice or tomato sauce, you could use V-8. You just might have to cook down some for applications that require a thicker sauce. It’s handy to use because it already has the bit of spiciness. I’m sure you’ll find great uses for it! Sounds like you’ve already got some great ideas… maybe do a combo of all. Give some away to the food pantry, have a bloody mary party, make gazpacho…. Hmmm….I use it as a liquid in my chili (sorry Scary Mommy, but in this part of Texas, Vegetarian Chili doesn’t fly) and as a base in Gazpacho. Most recipes for gazpacho ask for tomato juice, but I think the V-8 has a better flavor. Personally I like it, and during my first pregnancy I actually craved it, with lots of fresh black pepper and lemon juice. But then I also craved citrus fruit too. I am very weird. As much as I love tomatoes and veggies, I have tried on numerous occasions to drink this stuff and I can’t get it down. Sorry I can’t be of any help. Okay, my first try at this comment did not go through, so I will try again. I do a lot of Cajun dishes, and I see no real difficulty in using up all those cans of V-8. First you make a roux, add the trinity (chopped onions, celery, and bell pepper) and use the V-8 for the liquid, and you have the base for a good stew. You can either add shrimp, crawfish, or fish, sausage, chicken, you name it. Also in catfish courtbullion, it would be a good substitution for the tomato juice, because with the addition of the bay leaves, they give it a very distinctive flavor. Then there is a second way to use the V-8 and that is to add Italian seasonings and use it as a base for something Italian calling for tomato sauce, and using the V-8 as a substitute. Tomato basil soup is another way to use it. Good luck. I am sure you will think of an excellent way to use it up. Barbie, love the ideas. I am allergic to all bell peppers tho, what could I substitute and still get that flavor? Maybe you could donate to a rescue shelter (for animals) or a wildlife center to bathe stinky animals in. OR a church that serves meals to the needy. I’d like to know why you have so many. Looks like you’ll be doing tons of sauces and stews. Reduce it down, add honey, and turn it into a glaze. I was going to say Bloody Mary’s, but then you told me not to! V-8 is way tooooo salty for me. Maybe poach some fishies in a big vat of it? Donate them to a food pantry. You could use it to make a delicious chicken cacciatore. My friend Janey’s mom used to use v-8 or snappy tom as a base for this really delish soup. She was a fabulous cook originally from Chicago (we lived in AZ). She called it “old Jew soup” and I think it was one of those family recipes that passes down through time. No exact measurements, but it was so good! I have yet to find anything with that name in a Jewish cookbook but I think it may be goulash-type soup. It had ground meet in it, cabbage, potatoes, veggies and a little bit of tabasco or other hot sauce for kick (maybe that was her AZ kick to it all). I say give it to a homeless shelter or a food drive. That stuff tastes nasty, but, you know, it’s very healthy and those folks could use the extra vitamins. Allow your boys to get in touch with nature – let them play Monkey-In-The-Middle with a skunk. Then you can bathe them in the V8. Please note I am speaking from experience. Well I was going to say use it for stock in soup, but plenty of people beat me to it. Lisa’s Jewish soup sounds great. Well, I assume you don’t want to party with a bunch of skunks then take a bath afterward. So, recipes? I don’t have any ideas. I like fresh tomatoes but have never been a big fan of tomato juice. I am certain you could make some wonderful sauce for chicken and pasta though. The soup and chili ideas are good, but I’d think about donating them to a food pantry. I’m sure they would love to have them and they would not go to waste. I make veggie soup and chili with V8. We drink it (even my dog Sam (a Havanese) loves it. Sam loves tomatoes and anything tomato based. I vote keep some for cooking and give the rest to a food pantry. Risotto, using the v8 instead of broth. All kidding aside (and there’s plenty to work with there), with hunger, homelessness and unemployment at an all time high here in the Willamette Valley, ANY food bank would love to have them. Reduce by half and use as a sauce for pasta. I use tomatoe paste, V8, parmesan and seasoning to make pizza sauce. Wow, 48 cans will make alot of pizza sauce. You can also freeze the V8 juice in ice trays and when frozen put in zipper top bag and use these for drinks, sauces or whenever you need a V8! Some kind of soup?? I’m sure you’ll be able to come up w/ a great idea!! I have nothing to add that hasn’t already been said… but now I’m dying to have one! Combine tomatoes, juice/and or stock in saucepan. Simmer 30 minutes. Puree, along with the basil leaves, in small batches, in blender, food processor (or better yet, one of those handy hand-held food blenders, right in the cooking pan). Return to saucepan and add cream and butter, while stirring over low heat. Garnish with basil leaves and serve with your favorite bread. Soup base or donation. You’ve gotten some great feedback. Big pot…all cans of juice…crushed tomates, spices, sugar (important) and cook it all down for a really long time…6-8 hours…pour into jars or freeze…spa”ghetto” sauce. I am serious…it is really good. I make a great brisket with only 3 ingredients (so easy): 1 can ginger ale, 1 package of Lipton onion soup mix, and 1 can of V-8 juice (about 12 ounces). You just dump it all in pot and stick it in the oven for a long time. I use my le creuset pot and keep the lid on. I usually put the oven on around 350 and cook it about 4 hours until the brisket falls apart. In the last hour, I add carrots and potatoes. You can also cook it in a crock pot on low all day. It is really good! The sauce is the best part. And it is really hard to mess it up. Looks like you have lots of good suggestions. I like tomato juice so I would keep it simple and just drink it. Well, if all else fails, you could donate them to a local nursing facility or something. Baylor did a study and found drinking veggie juice helps people combat Metabolic Syndrome and lose weight. I’ve made this and it is WONDERFUL! Gosh, I wish I have an idea. I never even bought this, and don’t even know how it tastes. I am sorry Cathy! Well let’s see, I think a pasta based sauce is probably the best idea becuase it’s already seasoned well. You are probably trying to clean out your freezer for the move so you don’t want to use it for anything in bulk. This was a fun game and I loved reading all the responses. Can we do this once a week? I’m sure you could use it in a ton of different recipes, where it calls for tomato sauce or something. I love drinking it , but unfortnately I have never cooked with it! Good luck! I use V-8, especially the spicey version, as the base for my chili. It turns out really quite good. Although, it’s not chili weather, you could always freeze it for later. GAZPACHO!! It makes the best There are several recipes put there if you need one let me know!! I’ve used V-8 to replace tomato sauce and/or tomato juice in a lot of recipes; from chili to any kind of tomato based soup. Or, make it easy. Drink a few and donate the rest. Hmmm. You could let some skunks loose in your yard and be sure to get sprayed and be sure that your kids and husband get sprayed too. Then, you could all bathe in a big bath of V8 juice to get rid of the smell. Done. Search no further for what to do with those 80 cans. Basically I throw lentils, curry powder, tomato juice (or V-8), and various sturdy veggies in a crock pot with a few spices and let it go for 6-8 hours on low. It’s easy, healthy, and will use up a bunch of V-8. Plus, it freezes well, so you can make a big batch and have lunch on the days you don’t feel like cooking! you could always make soup out of it. boil some of it up, add in some veggies and sausage and pasta and garlic and some spices of course. could be really good. Blech…I can’t stand that stuff. If it were me, I’d give it ALL to a homeless/women’s shelter. I gag just thinking about that stuff. My hsuband and daughter love drinking it but I’ve never made a recipe with it…sorry I am no help. Lots of great ideas up there. I use it as a base for my vegetable beef stew. I generally pour one of those large bottles in with a few cups of water to form the stock. I’m sure you have the rest…although I also cheat a little before it’s finished and add a packet of herb gravy and a packet of mushroom gravy to the stew to help thicken it and add a little extra flavor. See if they really work…drink one and you will get some great ideas maybe…who knows….I do use V8 when I throw stuff together like ground beef, macaroni, green beans, you know throw together poor man’s goulash meal….nothing like your spectacular meals…..go ahead drink one and see what happens…..maybe like a science project or something. I haven’t read whether or not anyone has mentioned this one…it is fantastic in a meatloaf….or a stew. I would probably donate it. Or force myself to drink a can a day until they are gone. I just cant imagine subbing it for tomatos in Gazpacho. I like it to taste fresh, made with fresh tomatoes. V8 would ruin it! Instead of tomato soup cake, try tomato juice cake. The V8 isn’t as thick as tomato juice, but the recipe could be adjusted accordingly. Also, shrimp cocktail! Mexican style shrimp cocktail is often served in a bloody mary-like broth (without the alcohol of course). You could make it as spicy, or limey as you want. Delicious! You’ve gotten some great ideas! I also like MPM’s idea of donating it to a food bank… But use some of it to make something first so we can see what you created! I like the food pantry idea. I hate V-8. Hope someone else was helpful! You can make Chimichangas! My family is from Mexico and my grandmother makes her chimichangas by cooking the chicken and vegetables in V8 juice and then stuffing it into tortillas and frying them until crunchy. DELICIOUS. Use them as a base for a BBQ sauce. Maybe a few different sauces, varying the spices. ok, you said no bloody marys, but you could maybe substitute it for the tomato juice in this bloody mary terrine? Make Gazpacho for one thing. Use it in making homemade salsa. Use it as a base for sauce… like spagetti sauce. I like to use it as a replacement for the water in rice and couscous. It gives the grain a really delicate flavor, and a beautiful color! My God woman..Thats a hell of a lot of juice! I dont like the stuff, so I would have no clue what to do with it. Gazpacho! It’s the secret ingredient in my favorite gazpacho — well, V-8, and balsamic vinegar. Go for it. See, now I was going to say “Bloody Marys and plenty of them!” but you had to spoil it. Heh. While I can’t drink the juice outright, I do add it to my soups and chili recipes in place of chicken broth, or do half chicken broth/half V-8 juice. I wished I loved bloody mary’s because I would make them so spicy! Cathy, V8 juice makes a great base for ministrone soup. Dump a few cans in a large pot, add a couple cans of red beans, garlic, onion, green beans, zucchini, mushrooms,bell pepper oregano, basil & rosemary, & pasta. I bet the local food pantry would be happy to have it. Send your boys out to play in the woods, allow them to get sprayed by a skunk, bathe them in a bath full of tomato juice, and never again fear that they will chase after black and white critters. Hi Cathy .. raise money for charity .. sit in a bath full .. for how long have you got = not long with packing I guess ..
Good luck .. it’ll be interesting to see what you do decide to do ..
Ther’s another option .. not sure if you have it here .. but at home some fo the supermarkets have ‘product bins’ for the homeless, or raising funds at a fundraising do .. do you have similar here? I’m sure you’ll make excellent use of them ..
Low cal pasta sauce base. My cousin always pours v8 in with chicken before she freezes it, and then when she unfreezes it she rinces the v8 off. It leaves the meat really tender for grilling!!! Here’s a site for recipes if you haven’t already gotten the link from someone. Years back a friend of mine had a delicious recipe for beef stew using V8 juice. I don’t have the recipe but I’m sure if you google it that will bring it up from somewhere….worth a try. Donate what you cannot use to a food pantry. http://www.v8juice.com/Recipes.aspx This is a link to the V8 recipe site. They have loads of recipes there for you! Wow. 43 cans of the stuff! I buy a small can every so often to make a tomato-ey, Mexican-style vinaigrette (V8, lime juice, a little olive oil, ground cumin, chopped cilantro, a bit of chipotle…and so on) but 43 cans is a lot to get rid of! A base for a huge pot of chili, perhaps? Use them as a base for soups, its so yummy! It makes the best veggie & minestrone! I’s kind of hot but I make vegetable soup with V8 as my base. Maybe a nice cold gazpacho? It can substitute for tomato sauce and has a nice spicy addition to those recipes. Aside from chilled over ice or as a Bloody Mary, I’d go for Gazpacho. I just remembered how I got rid of boxes of pasta…We had a card party and the winning hand for each round got to choose a prize.It was shells or tri-color twists or bowties,it was funny too! So as you pack your pantry you may come up with a party with some unusual prizes such as V8. Sangrita! If you mix half V-8 and half orange juice, then add a little worcestershire and/or tabasco to your taste, then shake with ice and strain, you have a version of sangrita. You sip it alternately with tequila and though it sounds bizarre and kind of disgusting, it’s extremely tasty. An excellent pre-dinner drink, especially when you’ve just about had it with packing all day. ummmm..drop them off at the food bank? I always use V-8 for the base of my cabbage soup. I use spicy, but regular will work, too. Maybe you can use it to wash a skunked dog? Definitely use it as a base for some hearty soups, maybe freeze them for colder weather or go for the gazpacho ASAP! It would make a tasty bbq glaze too! For me, I would totally look into donation. I use v-8 for gazpacho! you could also leave it out for the postal workers food drive! I’ve used it for a soup base. I like to drink one at lunch along with a string cheese! This is my favorite stew and it should help you use up all that yummy V8! I had to go back to read if you had purchased them accidentally or not…was wondering how anyone purchases so many or why…sale? But yes, top off any recipee, lasagna, cabbage rolls, any tomatoe based recipe. This is one of THE BEST soups i have ever made. http://allrecipes.com/Recipe/Big-Eds-Cajun-Shrimp-Soup/Detail.aspx we also add a can of corn, and some flavorful chorizo’s to give it a little something more! And just like chili its even better the next day! I am sure this far down the list someone has already said Gazpacho, but that’s my vote! Um….send some to me so I can drink Bloody Marys? 😉 Otherwise, I don’t know…that stuff grosses me out. It is very good as a soup base. What about sharing with all the people you will be moving away from? Give each family/person a can (or more) and challenge them to create a dish using the can(s) of V-8 to bring to a farewell potluck dinner? Maybe assign categories so you don’t get all stews or soups. Or save a few to experiment with and donate the rest to a food bank. I use them for a quick snack but that ain’t what cha are looking for. I would check the date before you get all excited….V-8 has a tendency to get strsngley thiickend when it sits on a shelf to long…still should be okay for cooking, but Mary’s?…maybe not so! The vegetable juice creates an inviting red color that forewarns of the snap in these spicy crackers, which comes from black pepper and hot pepper sauce. These are excellent party snacks. Preheat the oven to 325’F. Stir together the flour, salt, and pepper in a large bowl or in the food processor. Cut in the butter until the mixture resembles coarse meal. In a separate bowl, mix the V-8 and the hot pepper sauce. Add the V-8 mixture to the flour mixture and blend to form a dough that will hold together in a cohesive ball. Divide into 2 equal portions for rolling. On a floured surface or pastry cloth, roll thin, 1/16 to 1/8 inch thick. With a sharp knife, cut the dough into 2-inch squares and place them on an ungreased baking sheet. Bake for 20 to 25 minutes, turning over after 10 minutes. Cool on a rack. VARIATIONS: You can substitute or combine tomato juice and other vegetable juices with the V-8. For more spice, increase the hot pepper sauce or add celery seed, cayenne, or your favorite herb. Substituting 2/3 cup of wheat or oat bran for the same amount of flour will increases the healthfulness of these crackers. Make spaghetti sauce!! I usually use plain tomato juice but I am sure V8 works too. I make it in the crockpot with homemade meatballs and italian sausage – divine!!! It will use a lot of cans because I use a 64 oz jar of tomato juice, can of tomato paste. Cook sausage and meatballs. Throw them in with some italian spices (I cut sausage links into bite size pieces). Sausage will really flavor sauce. Cook all day. I also use V8 juice in my vegetable beef soup. I had a desire to make my own company, however I didn’t earn enough of money to do this. Thank God my close dude told to use the loan. Therefore I took the car loan and realized my old dream.